Cambodia is fast becoming known as an up-and-coming destination for expats seeking to retire overseas or simply looking to relocate and enjoy a better quality of life. This country is known as the Kingdom of Wonder for good reason. Everywhere you turn you’ll find something to amaze you… ancient temples abound, as do charming colonial cities, Buddhist temples, bustling local markets, lush green fields and mountains, unspoiled coastlines and pristine undeveloped islands. There is something here to suit everyone. There are so many reasons why Cambodia is a suitable place to enjoy your retirement, such as the extremely low cost of living, some of the simplest and most flexible visa requirements available in Southeast Asia, the welcoming local population and the benefits of living in a fast growing economy, where everything from cinemas showing the latest blockbusters to international airports are in close proximity. And, of course, Cambodia is also one of the region’s tourism hotspots with millions of visitors pouring in each year to take in the temples of Angkor Wat and explore the cities and coastal resorts, meaning the country remains eager to cater to Western standards and requirements, with English being spoken widely by many Cambodians in the urban and tourist areas. The capital, Phnom Penh, remains the top choice for expats. Here, everything you desire is easily available. The city offers a mix of old and new, with modern property developments and shopping centres being built around the existing landmarks and colonial buildings. Expats here are spoilt for choice when it comes to fine dining and there is a thriving network of expat associations and communities, as well as a big social scene. Siem Reap is another popular choice, especially for those with a love of exploring temples—the Angkor Wat Complex covers an astounding 1,625,999 square metres. Known as “temple town”, Siem Reap city is also a bustling, but relatively small, metropolis. With a picturesque river running through it and its local markets and temples, as well as the old French colonial quarter, it’s a pleasant place to call home. The famous “Pub Street” also means that there is no shortage of bars or restaurants to keep you entertained and well-fed. Sihanoukville is Cambodia’s largest and most popular coastal resort which attracts foreign tourists, expats and locals to its shores. With a large number of beaches to choose from and over 30 pristine and undeveloped islands to explore you will quickly come to understand the attractions of this small city. The laidback, colonial city of Battambang is the second largest city in Cambodia. With a small, but growing, expat population there are a number of restaurants, bars and hotels, many of which are held in quite high esteem. Kep and Kampot are two complimentary locations in the south of Cambodia that have captured the heart of many an expat. Kampot is a riverside town where life goes by at a leisurely pace. The area is known for its world famous Kampot Pepper, as well as its prominence as a stopover for tourists on their way to visit the Damrei and Bokor mountains. A decent number of quality restaurants and hotels have grown to accommodate both tourists and expats from Phnom Penh who come to enjoy water sport activities on the river. Kep is just down the road from Kampot and is known as the “Saint Tropez of Southeast Asia”, due to its development by French colonialists to become what is now Cambodia’s second main coastal resort. The French influence is noticeable in the colonial villas around the town, which is centered around the beach and the fresh crab market. One of the many benefits to life in Cambodia is I’m perfectly placed for exploring all the delights of Southeast Asia. And the low costs here mean I can live a jet-set lifestyle even on a budget. Often on my travels I’ll end up chatting with fellow passengers who want to know more about my life in Cambodia. “Living in Cambodia has been a game changer for me,” says Paul Howard, 68. “The lifestyle I can afford is amazing and I feel a real sense of financial freedom compared to my life back in Australia. 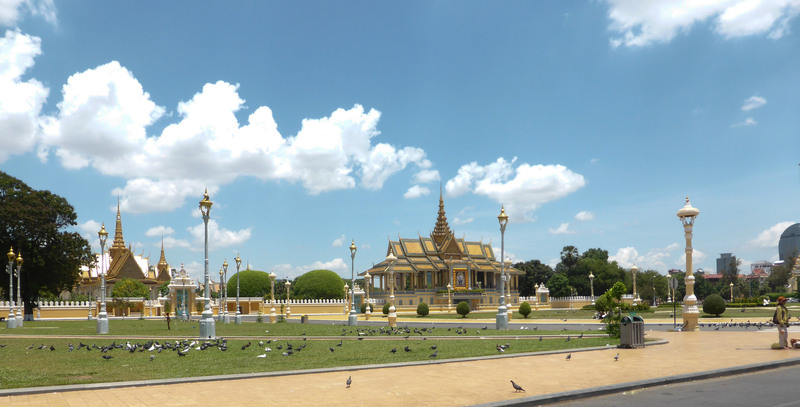 “Phnom Penh is where I call home now because it has so much to offer. Expats living in exotic destinations like Cambodia’s capital Phnom Penh enjoy when our families and friends visit as we get the chance to show them exactly why we love our new home so much. In the decade since I moved here I have perfected my role as a tour guide with an itinerary of the best sights to visit, cool places to explore and favourite haunts that I want my guests to see. If they’re only staying for a day or two then I have an essential list of things for us to do. One of the great things about living in Phnom Penh, Cambodia’s capital city, is that even a pauper can afford to live like a prince. The cost of living is incredibly low. Rent can be as little as a few hundred dollars a month for a decent apartment in the heart of the city and the cost eating out is so reasonable that you’ll never have to cook ever again. Here in Cambodia, it’s customary for local people to greet strangers, especially foreign visitors, with big, friendly smiles. Whether you go to a shop, visit a restaurant or are simply walking down the street, you’ll be greeted with warm, welcoming smiles. Cambodia is known throughout the world as the Kingdom of Wonder. My life here as an expat has long proven to me that it truly deserves that title. This magical country never ceases to amaze me and nor do the many ways in which the quality of my life has improved since moving here. Tourists and friends often ask me what is it that makes Cambodia so attractive to the many expats like me who have relocated here. Usually I answer this question in two ways: Firstly, I have a great love for the Kingdom of Cambodia, there’s a sense that anything can happen here and the best things in Phnom Penh are free. The beautiful scenic backdrops of the wide Parisian, tree-lined boulevards, the water and light displays that take place nightly at Independence Monument, a stroll down the picturesque Riverside, through the city’s parks and temples, encountering friendly local faces at every turn.